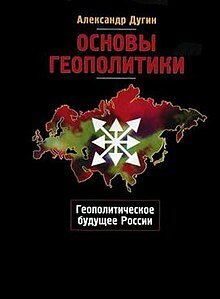 The Foundations of Geopolitics: The Geopolitical Future of Russia is a geopolitical book by Aleksandr Dugin. The book has had a large influence within the Russian military, police, and foreign policy elites and it has been used as a textbook in the Academy of the General Staff of the Russian military. Its publication in 1997 was well-received in Russia and powerful Russian political figures subsequently took an interest in Dugin, a Russian fascist and nationalist who has developed a close relationship with Russia's Academy of the General Staff. Dugin credits General Nikolai Klokotov of the Academy of the General Staff as co-author and main inspiration, though Klokotov denies this. Colonel General Leonid Ivashov, head of the International Department of the Russian Ministry of Defence, helped draft the book. Klokotov stated that in the future the book would "serve as a mighty ideological foundation for preparing a new military command". Dugin has asserted that the book has been adopted as a textbook in many Russian educational institutions. Former speaker of the Russian State Duma, Gennadiy Seleznyov, for whom Dugin was adviser on geopolitics, has "urged that Dugin's geopolitical doctrine be made a compulsory part of the school curriculum". Hoover Institution senior fellow John B. Dunlop stated that "the impact of this intended 'Eurasianist' textbook on key Russian elites testifies to the worrisome rise of fascist ideas and sentiments during the late Yeltsin and the Putin period". Historian Timothy Snyder wrote in The New York Review of Books that Foundations of Geopolitics is influenced by the work of Carl Schmitt, a proponent of a conservative international order whose work influenced the Nazis. He also noted Dugin's key role in forwarding the ideologies of Eurasianism and National Bolshevism. The book was described by Foreign Policy as "one of the most curious, impressive, and terrifying books to come out of Russia during the entire post-Soviet era", and "more sober than Dugin’s previous books, better argued, and shorn of occult references, numerology, traditionalism and other eccentric metaphysics". In 2017, news.com.au said that the book "reads like a to-do list for Putin's behaviour on the world stage". ^ a b c d e Dunlop, John B. (July 30, 2004). "Russia's New—and Frightening—"Ism"". Hoover Institution. Retrieved 12 October 2017. ^ a b c d "The Unlikely Origins of Russia's Manifest Destiny". Foreign Policy. Retrieved 2017-10-23. ^ Liverant, Yigal (Winter 2009). "The Prophet of the New Russian Empire". Azure. Jerusalem: Shalem Center (35). ISSN 0793-6664. Retrieved 2015-04-06. ^ "Classification of Dugin as a fascist is justified, regardless of the fact that today the MGU professor frequently speaks not as a primitive ethnocentrist or biological racist. (...) By «fascist» we understand the «generic» meaning of the concept, used in comparatory research of contemporary right-wing extremism by such well-known historians-comparativists as Alexandr Galkin (Moscow), Walter Laqueur (Washington), Stanley Payne (Madison), Wolfgang Wippermann (Berlin) or Roger Griffin (Oxford)", Андреас Умланд (22 June 2012). ""Евразийские" проекты Путина и Дугина – сходства и различия" [Dugin's "Eurasian" projects − similarities and differences]. Geopolitika (Lithuania). Retrieved 31 August 2015. ^ Koposov, Nikolay (October 13, 2017). Memory Laws, Memory Wars. Cambridge University Press. p. 211. ISBN 9781108419727. ^ Lavelle, Peter (2003). Uncovering Russia (excerpt: A civil society without civility). Norasco Publishing Ltd. pp. 379–380. ISBN 0972970800. ^ Firth, Charles (March 4, 2017). "1990s Manifesto outlining Russia's plans is starting to come true". news.com.au. Retrieved 12 October 2017. ^ Mankoff, Jeffrey (October 17, 2011). Russian Foreign Policy: The Return of Great Power Politics. Rowman & Littlefield. pp. 69–70. ^ a b c d e f g h i j k l m n o p q r s t u v w x y Dunlop, John (January 31, 2004). "Aleksandr Dugin's Foundations of Geopolitics" (PDF). Demokratizatsiya: The Journal of Post-Soviet Democratization. Institute for European, Russian and Eurasian Studies (George Washington University). 12 (1): 41. ISSN 1074-6846. OCLC 222569720. Archived from the original (PDF) on 7 June 2016. ^ Toal, Gerard (2017). Near Abroad: Putin, the West and the Contest Over Ukraine and the Caucasus. Oxford University Press. p. 78. ISBN 9780190253301. ^ "This is what Russian heavyweights wanted in the '90s". NewsComAu. Retrieved 2017-10-23.